Noisy kids wanted for SASO’s musical fancy-dress party! It’s time to plan for fancy dress and fun at St Albans Symphony Orchestra’s popular children’s concerts taking place on Sunday 21st October (2pm and 3.30pm, St Saviour’s Church, Sandpit Lane, St Albans). Children of all ages will be able to experience the thrilling sound of a symphony orchestra in full cry helping conductor Bjorn Bantock to tell an adventure story specially written for the occasion. This year’s entertainment includes favourite music from Bizet’s Children’s Games and Carmen suites, Ravel’s famous Boléro, a Japanese Suite by Holst and the toe-tapping Jamaican Rumba by Arthur Benjamin. 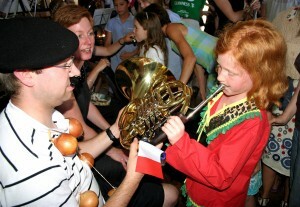 To add to the excitement, children in the audience are invited to meet the musicians during the concert interval and enjoy an opportunity to try out their instruments. Fancy dress isn’t compulsory, but – as usual –many members of the orchestra will be dressed as their favourite super-hero, monster, princess, prince or ‘baddie’. The concerts, which are specially suitable for children of primary school age, will also feature a short performance by young musicians from St Peter’s School, St Albans. Tickets £1 for (accompanied) children and £5 for grown-ups are available from the SASO Ticket Secretary, Frances Rotchell on 01727 857422 (tickets@saso.org.uk) or on the door.